Frank Sesno, director of the School of Media and Public Affairs, moderated a panel with media professionals and White House Press Secretary Sean Spicer. The School of Media and Public Affairs hosted a discussion about the media’s current and future role in the Trump administration at the Marvin Betts Theater Monday evening. Frank Sesno, director of SMPA, moderated a discussion with White House Press Secretary Sean Spicer about Spicer’s goals and takes on working with the press. He was followed by a panel with several journalists who cover the White House and the media, as well as a former White House press secretary. 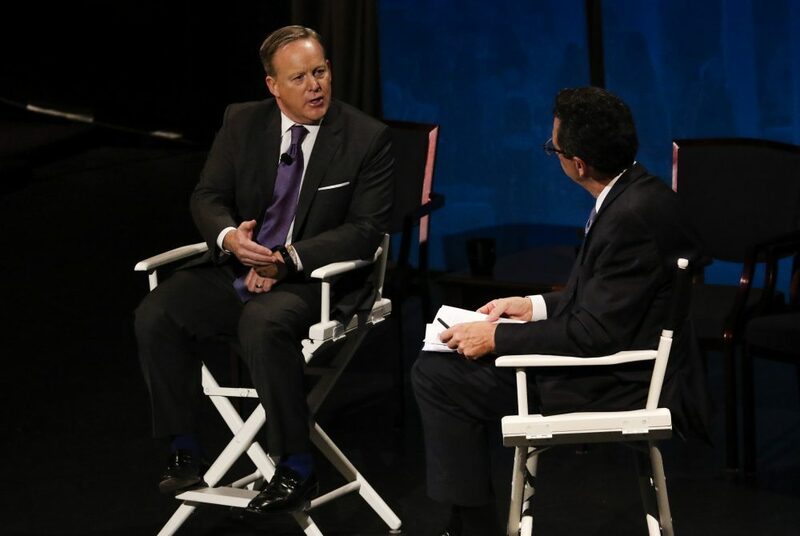 Sesno spoke with Spicer about how the White House expects to work with news media over the next four years. Spicer said the Trump administration will work closely with media but said media intentionally emphasize the negatives about the administration while the positives are ignored. Sesno agreed with Spicer that the media often leads on the negative and that is part of the problem in covering the new president. Sesno said that focusing on the negative may be why public opinion about the media is currently low, but noted that the same argument about negativity can be made about President Donald Trump’s strategy during his campaign. There is double standard held to the media and the White House, Spicer said. He said that when the White House makes a mistake, he is called a liar, while the media avoids criticism by posting corrections to published content. When asked about the type of relationship Trump wants to have with the press, Spicer said that the administration would like to have an “honest one”. Sesno said that media coverage of the 2016 presidential election did not speak for a large portion of the country, but that it is a complicated process to develop coverage that is representative of the nation. Ari Fleischer, former White House Press Secretary to George W. Bush, said the media has to be careful maintaining balanced coverage of Trump. Fleischer joked that under the stress of covering Trump, the media may long for the days of covering Bush. Fleischer said the reaction to Trump’s inaugural address provides an example of the differences between the media and the public’s interpretation. He used printouts of front page stories published the day after Trump’s inauguration and said newspapers broke tradition by qualifying and analyzing Trump’s speech, which they didn’t do for Bush or President Barack Obama. CNN Senior White House Correspondent Jim Acosta said that while it is important to represent the nation, it is crucial that the public and the media hold Trump’s power to account. Sesno said it is critical that the messages coming from the White House are credible and accurate. “What really matters is whether the American public is fully and accurately informed,” he said. Wall Street Journal White House correspondent Carol Lee said she and other journalists often have to parse Trump’s loud language for meaning, but added that his administration has given press the same kind of access they got from Obama. “With President Trump there’s a lot of fire and smoke and you’re kind of trying to sift through it,” she said. President of the White House Correspondents’ Association and Reuters White House correspondent Jeff Mason said that the media can gain public support by proving their commitment to accurate, even-handed news. “If the media reports accurately, it will boost their credibility,” Mason said. Hadas Gold, a Politico media and politics reporter, said the media often fails to separate news from opinion on the air, which contributes to the public’s growing confusion of what is an opinion and what is a fact. She added that news outlets do not do enough to ensure representative coverage. “The media tends to miss the story because maybe we’re not doing a good enough job of talking to people,” Gold said.